In this space, we’re taking a look back at the 2018 fantasy football season that was and trying to identify the six most-important takeaways and what that might mean for the 2019 season. The NFL has been around for 98 seasons, and across that near-century of football the 2018 season was, easily, our most efficient yet. The 2018 season offered new league-wide highs in yards per carry (4.42), passer rating (92.9), points per drive (2.00), and yards per drive (31.4). Was this an outlier? Should we be projecting a regression to the mean? Or is this a sign of things to come? I think it’s the latter. We’ve seen scoring and efficiency numbers trending upward for some time now. The reason why is multifactorial. Teams have taken a more pass-heavy approach in recent years, and with passing being so much more efficient than running, improved offensive efficiency of course has followed. On top of that, there have been myriad rule changes (and rules already in place being more stridently enforced) that have further benefited offenses while hampering defenses. For example, penalties meant to protect a defenseless receiver have turned the middle of the field from a no-man’s land to now the most efficient area of the field (on short, intermediate, and deep throws). Rules meant to better protect the quarterback, including an increase in roughing the passer penalties, has resulted in fewer sacks, less skittish and healthier quarterbacks, and better league-wide efficiency via the pass. Even the seemingly insignificant change of touchbacks starting on the 25-yard line means your offense is now five yards closer to the end zone. All of this adds up and gives the average fans what they want — a faster-paced, higher-scoring, more fantasy-friendly product. I’m not sure this means we should be attacking our fantasy drafts any differently in 2019, but I do think we should expect higher-scoring weeks moving forward. 2018 was a historic year for fantasy tight ends. George Kittle set the new record for most receiving yards by any tight end in a season (1,377). Zach Ertz set the new record for most receptions by a tight end in a season (116). And Travis Kelce trumped them both in fantasy points, with 294.6. Among all tight end seasons ever, Kelce ranked fourth, Ertz sixth, and Kittle 14th in fantasy points scored. After that, things got ugly. Not only were these three players historically great, but the tight ends ranking sixth through 12th were historically bad, recording all-decade lows in fantasy points scored. Value-based drafting is not without its flaws, but it’s also really the only way to measure the value of a fantasy asset across positions. 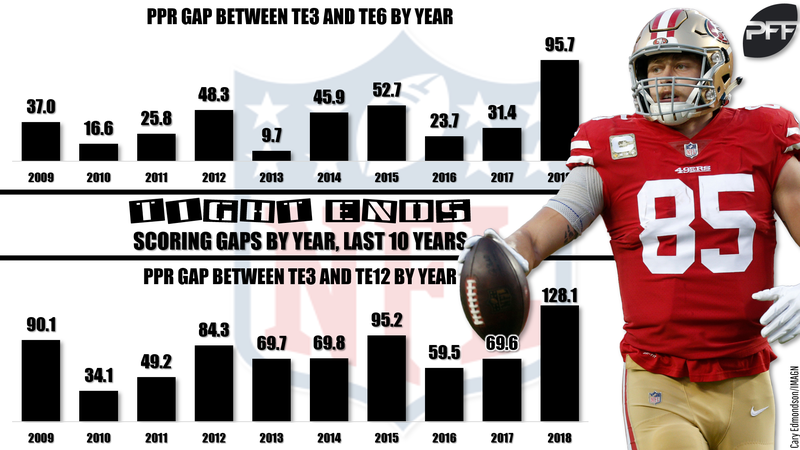 Due to the lack of parity between the “big three” tight ends and all tight ends ranking sixth through 12th, owning a high-end fantasy tight end might have mattered more in 2018 than in any other season this past decade. Kittle ranked third at the position but also outscored the tight end ranking sixth in fantasy points by 6.0 fantasy points per game. This was larger than the per-game difference between the highest-scoring wide receiver (DeAndre Hopkins) and the wide receiver ranking 12th in total fantasy points (Keenan Allen). Kittle also outscored the tight end ranking 12th in fantasy points by 8.0 fantasy points per game. This was just about equivalent to the per-game difference between Hopkins and the No. 19receiver (Jarvis Landry). Even among wide receivers, the “big three” tight ends held their own. Among wide receivers, Kelce would have ranked ninth, Ertz 10th, and Kittle 13th in total fantasy points. It’s very early, but by current ADP, all three tight ends are being drafted after the top-12 wide receivers. Remember, this is despite the fact that they nearly all would have ranked as WR1s themselves and also offer a positional advantage that far exceeds the worth of a WR1. What does this mean for 2019 fantasy drafts? It’s simple – try your best to pay up for one of these tight ends or punt the position entirely. 3. Did Patrick Mahomes break “late-round QB”? I’ve been an advocate of the “late-round quarterback” draft strategy for some time now. If you’re unfamiliar, basically that means being one of the last people in my league to draft a quarterback. This makes sense, because typically there isn’t much difference between highest-scoring quarterback and the quarterbacks ranking 10th through 14th in fantasy points scored. On top of that, we also haven’t seen a quarterback repeat a QB1 season since 2012. Mahomes was another late-round superstar in 2018, but he’ll be the first quarterback drafted in 2019, and rightfully so. He wasn’t just the highest-scoring fantasy quarterback this season, but his 2018 season was the best fantasy season by any quarterback in any season ever. Last year, he outscored the next-closest quarterback (Matt Ryan, who quietly put together a top-15 all-time fantasy season) by 3.9 fantasy points per game. He outscored the Nos. 6 and 12 quarterbacks by 6.5 and 8.4 fantasy points per game, respectively. Obviously, that would offer you a massive edge over your opponents if he can post similar numbers in 2019. This raises the question of whether he can repeat this historic feat. All of the data suggest he’s due for a massive regression and he won’t be able to repeat his 2018 season, but of course that’s always what the data suggest. This level of production is unrivaled, especially so in contrast to any other quarterback’s first full season as a starter. The problem with constantly predicting a regression to the mean is you miss out on outliers. You’ll be right far more often than you’re wrong, but you’ll miss out on other-worldly talents with league-winning upside like Alvin Kamara, Rob Gronkowski, and Tyreek Hill. These players were “due for a regression” in almost every year of their careers but have consistently overachieved their expectations. These players have made a career out of being outliers, and they’re outliers for a good reason – they’re just really good at football. I’d bet Mahomes is one of those players. Still, though he certainly warrants a QB1 draft status, I’d bet his ADP winds up being too rich for my blood (top-24 overall). Though we’ve seen a decline in rushing volume, running backs are being used more as receivers today than in almost any other season in recent memory. 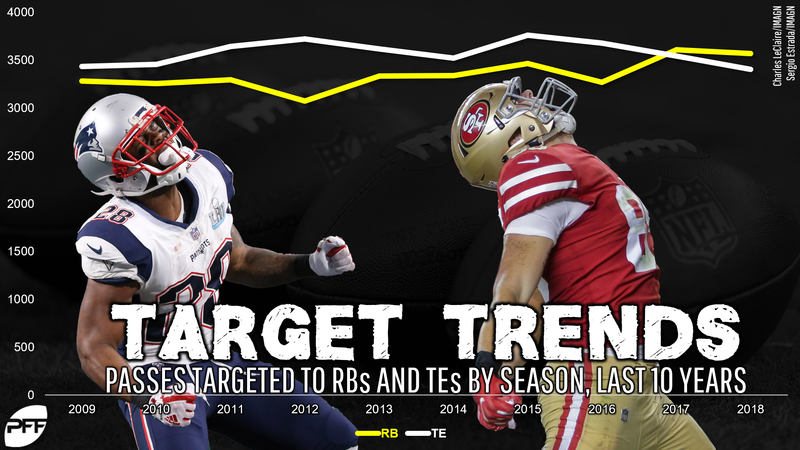 Over the past two seasons, running backs have combined to draw 7,179 targets, or 303 more than in any other two-year stretch this past decade. In 2018, Christian McCaffrey set the new single-season running back record for receptions with 107. Saquon Barkley wasn’t too far behind with 91 (seventh-most), nor was James White with 87 (14th). Perhaps not coincidentally, McCaffrey ranked first among all flex-eligible players in fantasy points scored during the fantasy season (Weeks 1-16), while Barkley would have ranked first if we included Week 17, and both seasons rank top-20 all-time in fantasy points scored by a running back. This is massive for fantasy football because, remember, for running backs targets are worth 2.74 times as much as a carry in PPR leagues. As I’ve been arguing for years now, when drafting, prioritize bell-cow running backs, and devalue the more one-dimensional running backs. You want a running back who is likely to see a high number of snaps and a high percentage of his team’s snaps, and one who is used in both the running and passing games. Not only does this give you a higher ceiling and floor, but it also gives you more week-to-week consistency and predictability. Take, for instance, Adrian Peterson, who wasn’t heavily utilized in the passing game. He was massively gamescript dependent. In 2018, he averaged 16.7 fantasy points per game in victories (seven such games) and 8.5 fantasy points per game in losses (eight such games). 5. Zero RB — smart for the NFL, dumb for fantasy? How important is an elite running back in the NFL? Apparently not very much. If you asked anyone last year who the best running back was in the NFL, they would either say Le’Veon Bell or Todd Gurley. Bell averages 21.9 fantasy points per game throughout his career, or the second-most by any player ever throughout their first five seasons in the NFL. In 2018, James Conner – a former third-round pick with 32 career touches heading into the season — averaged 21.5 fantasy points per game. Gurley was a fantasy superstar throughout much of the season but was out-touched by C.J. Anderson in the fantasy playoffs 49 to 34. Keep in mind, Gurley said multiple times he was fully healthy, and Anderson drew little interest in free agency and was signed off the streets in December. PFF’s Eric Eager artfully expanded on this point here, calling the replaceability of the running back position the top storyline of the 2018 season. How important are running backs for fantasy football? The running back position is the most important position, but also the toughest to predict. Everything I said in this article last offseason, debating the merits of the zero-RB philosophy, remains true today. The running back position is typically where you’ll find your fantasy league-winners. All of the top-six highest-scoring flex-eligible players (by fantasy points per game) were running backs. The difference between the highest-scoring running back and the highest-scoring wide receiver was worth 4.6 fantasy points per game. The difference between the highest-scoring running back and the running back ranking 12th in total fantasy points was worth an advantage of 11.7 fantasy points per game. As mentioned a few paragraphs ago, in 2019 drafts, you should target the league’s few bell-cow running backs in the early rounds of your draft and then prioritize other positions in the middle rounds. Here’s a little secret: More than any other stat, you want to look for running backs who rank highly in snaps. In 2018, McCaffrey led the position (966), followed by Ezekiel Elliott (890), and then Barkley (852). In some sort of order, those will probably be the first three players drafted in the majority of 2019 drafts. Last offseason, I discussed how rushing volume was a sort of cheat code (colloquially known as the “Konami Code”) for inefficient quarterbacks. 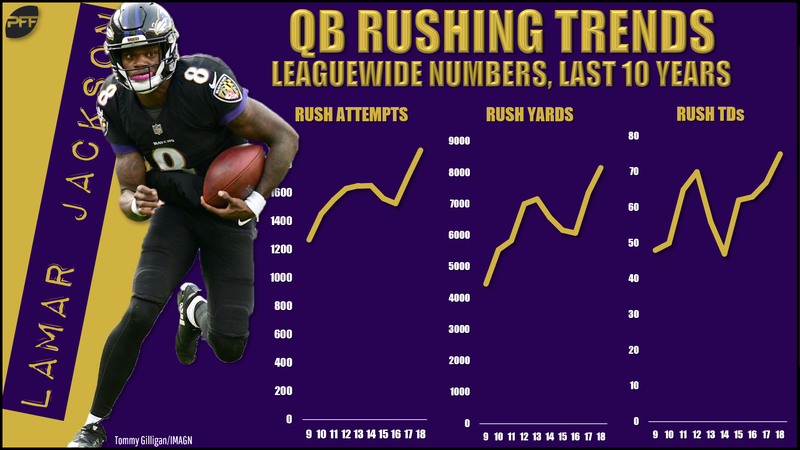 In 2018 we saw new all-decade highs in rushing attempts, rushing yards, and rushing touchdowns from quarterbacks. This was despite near-career-lows in rushing volume and production from Cam Newton and Russell Wilson. Two rookies – Josh Allen and Lamar Jackson – exemplified the “Konami Code” better than any quarterback since maybe Tim Tebow. From Week 11 until end of the regular season, Allen ranked second and Jackson 11th (of 32 qualifying quarterbacks) in fantasy points per game. This was despite the fact that Allen ranked second-worst and Jackson sixth-worst in passer rating. In 2019 drafts, fantasy players will really have to put the “Konami Code” to the test – holding their nose to draft Allen or Jackson and hoping their rushing production will be enough to float QB1 numbers.